Half the carbs of regular bread. High in fibre and protein. 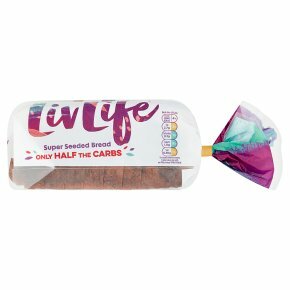 Suitable for vegans.Sliced bread made with linseeds, sunflower seeds & pumpkin seeds New Livlife bread has around half of carbohydrates of regular bread. That's because we've baked it using natural vegetable protein flours to replace some of the wheat flour. So now you can enjoy bread with reduced carbs.